A WIGAN primary school is to remain closed for another week, following a health and safety scare. The headteacher of Gilded Hollins School, in Leigh, advised staff and pupils to stay away after a strong smell was detected on Thursday September 10. An emergency gas team was called but they could find no evidence of a leak. 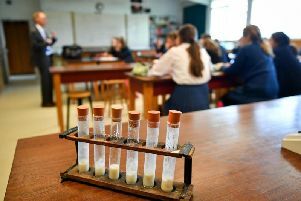 But after some staff complained of feeling unwell, a decision was made for the school to close from last Monday while further tests are carried out. Pupils have been allocated an entire block of classrooms at nearby Lowton High, along with two playgrounds and a canteen solely for their use. Headteacher Darran Nash has been keeping pupils up to date on the school website. He said: “The school has been closed for tests following the discovery of an unpleasant, unidentified odour in parts of the building. We will be at Lowton High for at least the coming week while further analysis takes place at Gilded Hollins. We are hoping to have further updates on air quality by the middle of the week. Lowton High headteacher Julian Pollard said: “When we found out the school was closed, I offered them space at Lowton.